Heading north on Route 63, Ruby’s Inn sat quiet and empty, a lonely rusted blue dot pickup truck the only sign from another night. I left camp while the sun slept, but as I turned east on Route 12, she whispered a muted hello. Smudges of smoky grey clung to the horizon when minutes later she raised her voice in blurred pink and auburn, softened by a chorus of ghost white clouds. As I passed the great striped hoodoos of Shakespeare Point, she sang a simple, single note of yellow into a morning sky of perfect blue. Steadily rising to her full height, I drove headlong into glaring melodic light. It is 124 miles from Bryce Canyon to Capital Reef via Utah’s Scenic Byway 12. Also designated an All-American Road, this section of Route 12 leads you through a landscape magnificently varied. The Henry Mountains, home of the only free ranging bison in America, stand isolated – brooding over the hidden north shore of Lake Powell to the south. Ever changing sandstone flaunts shades of salmon, burnt orange, cream, peach, chestnut and amber. Grand Staircase-Escalante National Monument, spreads across the landscape, unspoiled, a black ribbon her only flaw. Hairpin turns on the ‘Hogsback’ between Escalante and Boulder, stare into dark canyons, before rising to white aspen forests picketed by green sub-alpine fir. High plateau meadow-lands reach 9,000 feet above the sea before descending back to the desert. Down into the Waterpocket Fold. A wrinkle in the earth that is Capitol Reef. Route 12 through the ‘Hogsback’. It reminded me of the slot-car racetrack set I got for Christmas when I was 10. I was always Jackie Stewart. “Whereas certain public lands in the State of Utah contain narrow canyons displaying evidence of ancient sand dune deposits of unusual scientific value, and have situated thereon various other objects of geological and scientific interest; and Whereas it appears that it would be in the public interest to reserve such lands as a national monument, to be known as the Capitol Reef National Monument…” – Proclamation No. 2246 on August 2, 1937, Page 136 by President Franklin D. Roosevelt. Thirty four years later, An Act to Establish Capitol Reef National Park in the State of Utah, became Public Law 92-207. President Nixon signed the Act on December 18, 1971, setting aside 254,000 protected acres. Six months later, on June 17, 1972, several men broke into the Democratic National Committee headquarters at the Watergate Hotel. It is rumored that Forrest Gump was staying at a hotel across the street from the Watergate and telephoned police. Nixon resigned on August 9, 1974. He never publicly blamed Gump. Entering the park on Route 24 from the west, you are greeted by massive cliffs running north and south – the western escarpment of Capitol Reef. Layers of rock, once sediments, build this 100 mile long tilted reef, the largest and best exposed monocline in North America. Having withstood the elements over thousands of years, gaining character from the effects of gravity, she is an imposing figure. Blue skies stand in contrast to the ocher and bronze coloring of her rock strewn, sliced and uneven face. Majestically she stands as if eternally waiting for Thomas Moran to lift his brush. As a storm moved across the reef I took dozens of photos. Several look more like paintings than photographs. In the 1870’s Brigham Young instructed his followers to “… make gardens, orchards, and vineyards, and render the earth so pleasant that when you look upon your labors you may do so with pleasure, and that angels may delight to come and visit your beautiful locations.” Just south of the visitor center, remnants of the small Mormon community of Fruita, still dot the landscape along the Freemont River. No more than ten families at one time were sustained by the fertile flood plain. Today a working farm, one room schoolhouse and blacksmith’s workshop still stand alongside the river. Perfectly rowed apple orchards, also remain as testament to Nels Johnson plantings in 1880. Several horses live in Fruita area of the park. It is rent controlled and they won’t move. 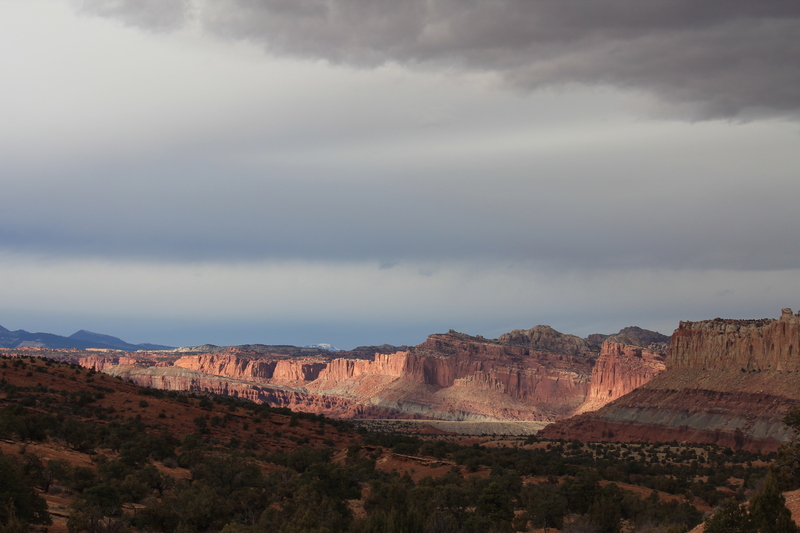 Traveling southeast, a winding scenic drive escorts you through the diverse geological landscapes of Capitol Reef. The Moenkopi Formation, 225 million year old rock, more than 950 feet thick, layered in volcanic ash. The Chinle Formation, rich in petrified wood. Imposing, sheer cliffs of Wingate Sandstone, once dunes of an ancient desert. Slickrock Divide separates stream-beds that channel rain runoff – Grand Wash to the north, and Capitol Gorge to the south. The Navajo Formation, with its greyish-white pockmarked domes and smooth shoulders. Deep canyons and pioneer signatures of Capitol Gorge. Although I am not a geologist (or any type of ‘ologist’ for that matter), the spectacle of earth’s diversity was not lost on me. Black, grey, yellow and blue. The majestic reef, set against a roiling sky about to open. Two unpaved spurs lead into great canyons – Grand Wash to the north and Capitol George to the south. The latter begins with a road designed to test axles and determine whether or not a vehicle can only travel 2.4 miles in 30 minutes (it can). But what a 30 minute drive. High canyon walls streaked by time and unevenly black varnished, rise up on either side and block the low hanging sun. Great boulders fallen from their heavenly perch, now nestle against cliffs of Wingate sandstone. Colossal oval pockets carved high in eroding domes sit like portals into another world. Small scrub bushes find the tiniest crack and take hold, dotting green into rocks. Each kink and coil in the road presents a new visual gift, until ending at a small open space and the Capitol Gorge trailhead. I’m fairly convinced that this is actually an alien barcode. I could be wrong. One of the first things I do when entering a park for the first time is seek out a ranger and ask which trails I should hike. I generally like hikes that are 2-5 miles long (I do longer and shorter as well) and loop instead of going out and back. In this case, the ranger recommended several hikes and then brought out a photograph of ‘The Tanks’ and said, “These are very cool and worth the hike. It’s only about a mile to the bottom of the climb.” The photo showed a beautiful carved pool of rock, filled with crystal clear water. “These are pockets carved over time by wind and rain and then filled with rainwater or snow runoff.” I’m in. The hike into the gorge takes you past the Pioneer Register – names carved high into the soft stone. M Larson, November 29, 1888. Ellis Pritchett, 1912. Further on, worn prehistoric petroglyphs of Fremont Culture origin decorate the walls. The trail is rocky but relatively flat and you arrive at the base of the ‘Tanks’ in about 30 minutes. To get to the ‘Tanks’, you have to climb a series of boulders and cross a smooth rock face. There are no signs once you reach the top, only small cairns here and there to help guide. But before I see a cairn I climb another set of boulders thinking that I might be able to see the ‘Tanks’ from above. No such luck, so back down to a now visible cairn I went. This is when I stumbled into Aurélien and Claire. Pioneer Register. If you look closely you can barely make out ‘Fred and Barney, 1955 BC’. An ancient symbol high on the sandstone. This rock was once at a level where someone could stand and carve. Now it is 20-30 feet from the ground. Aurélien and Claire are from Paris. France, not Kentucky. Their English is quite good and we stood next to the empty hot tub and talked for a long time. “I am Aurélien and this is Claire. Pleased to meet you.” Smitty. Call me Smitty. “Smitty. This is a good name. What are you doing Smitty? What brings you here to this place?” I explain. And you? “We are several months in the United States. We are traveling to see as much as possible. It is a big country.” Yes, it is. Where have you been? They rattle off many places, many states, many national parks. “We are going back to New York to fly home, but have almost two months before we leave.” Where are you heading? “We are still deciding. Maybe you can help, no?” I would be happy to recommend a few places between here and New York – and I did. Aurélien and Claire from Paris, France. Two of the best people I have met on my journey. I found out it is a law in France that you must wear a scarf. Why did you come to America? “We wanted to see all the beautiful places we have read about. It is not enough to read about them,” said Claire. “You have everything in one country. You are lucky.” I agree. But Europe is also beautiful. “Yes, but small. America is bigger scale. Impossible to see it all.” In speaking with travelers from around the world, I am always struck by their awareness of our country’s boundless diverse beauty. They are in awe of something that many who call this home, take for granted or never explore. “Can we take your photo?” asks Aurélien. “You have an interesting face and hair.” Now I know you guys are not from around here. We take photos of each other, promising to email copies to one another (we did). They tell me they will send their contact info so I can suggest a few stops on their journey to New York. I tell them it would be my pleasure and we part (I sent suggestions). They head back down the trail, while I sit and try to imagine what a hole in the rock would look like if full. This is Smitty. He of interesting hair. It’s nine miles from the visitor center to the eastern edge of the park along Route 24, the only road to traverse the Waterpocket Fold. The Freemont River traces the two-lane road, rarely giving more than 25 yards distance. Several times I stopped and walked down into the cottonwoods and prickly underbrush to see the river – to listen to the river. Lined in yellow atop a single brown bank, the muddy water ran fast, bumping the shore, kidnapping soil from its edge. Layered sandstone, creviced and shedding, defined the river’s northerly shape. Sand and soil joined in a timeless struggle against an ever moving river. As I sat above the water, early sun cleared the North Blue Flats and Red Desert to the east. The air was crisp and the great cliffs of the fold came into clear detail – colors jumping off streaked stone. A low wind came down into the tall grass, following the river and this became a kind of silence. I dipped my feet into the chilly water, before walking out of the cottonwoods and back to my journey. Yellow Indian grass along the muddy Freemont River. The van. There is no further explanation needed. One of the capitol dome-like formations that give the park its name. They thought about Beehive Hairdo National Park, but Nixon vetoed. View of reef and Henry Mountains from Panorama Point, just inside the northern border of the park. Gentle sandstone folds glow in late afternoon sun. Fruita Cliffs before the storm. Where reef and mountains meet sky and clouds. Shed at the end of Pleasant Creek Road. A frog in the rock. Frozen in time when Mt. Vesuvius erupted. NOTE: For more information on Capitol Reef National Park and all the National Parks and to help with trip planning, download the free Chimani app to your smart phone to easily navigate your way around the park, with or without cell phone service.